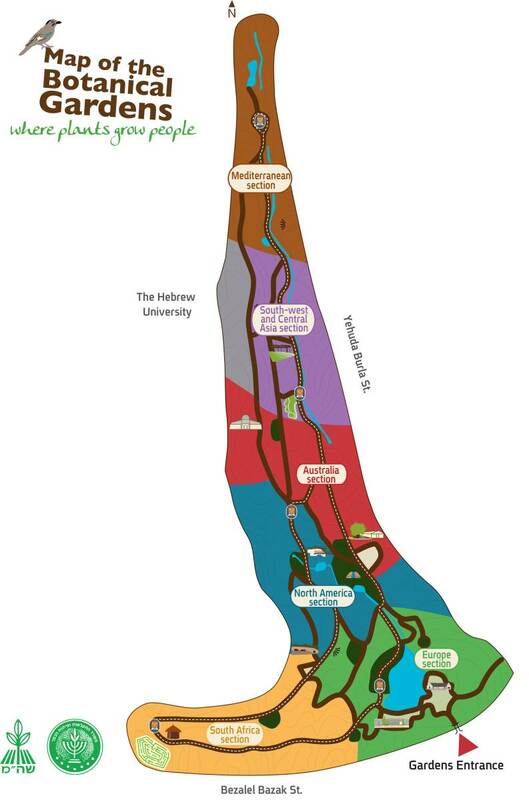 The Jerusalem Botanical Gardens serve as a centre for education, research, agriculture, tourism and recreation. Covering 45 acres, the Gardens introduce plants from different parts of the world and display more than 6,000 taxa, the largest plant collection in Israel and the Middle East. The Gardens welcome more than 180,000 visitors every year with diverse activities. The Gardens’ sections (see map) represent important geographical regions. Geophytes, oaks, bonsai and other important collections are displayed throughout the Gardens. Plants from the tropics will be represented at the Dworsky's Conservatory, which is being renovated. The climate in Jerusalem – cold winters and hot, dry summers – enables the cultivation of plants from a wide range of habitats and climates. Introduced plants are assessed for their potential use in horticulture, forestry, agriculture, medicine and conservation. The Gardens also act as a living gene-bank to protect endangered plants in Israel and beyond and educate about them. More than 300 locally endangered species are grown already. The Gardens' school of horticulture provides courses and workshops in gardening, garden therapy, native flora, garden flora, medicinal plants and more. Additional programs for children are run regularly. The Gardens’ director is Mr. Tom Amit and the scientific director is Dr. Ori Fragman-Sapir. Feinbrun, N., 1978-1986, Flora Palaestina, Vols 3-4, Israel Academy of Sciences and Humanities. Fragman, O., Plitmann, U., Heller, D. & A. Shmida. 1999. Checklist and Ecological Data-Base of the Flora of Israel and its Surroundings. Miflalot Yeffe Nof & The Middle-East conservation promotion association. Zohary, M. 1966-1972, Flora Palaestina, Vols. 1-2, Israel Academy of Sciences and Humanities.